Blueberries and Chocolate, in my mind a perfect combination. 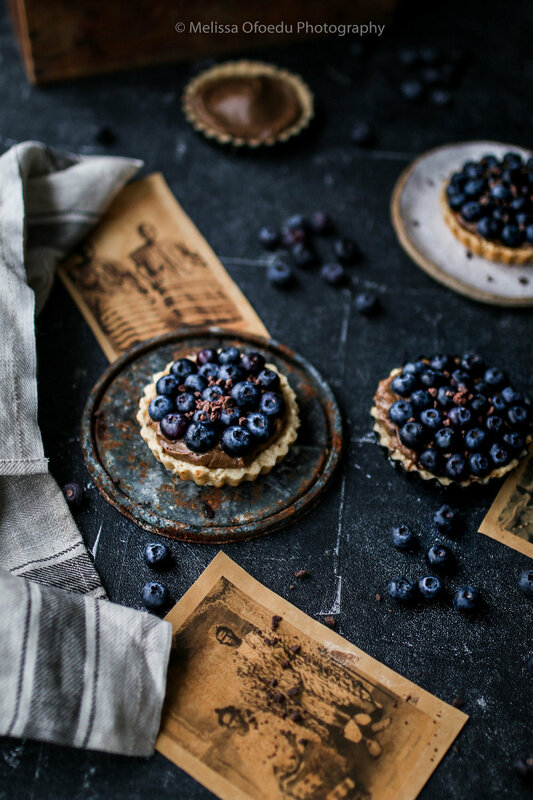 The fresh blueberries and the chocolate ganache line the homemade tarte and makes for a light but glamorous dessert for a diner party. You will probably have the ingredients for the recipe at home which makes it even easier. Enjoy this lovely but easy recipe to ring in the beautiful spring months. One of my favorite products and ingredients to use is a classic one, Chocolate. Used in many recipes and sourced mainly from the Ivory Coast, it is always hard to find good chocolate which can be used for my baking needs and which is Fairtrade and organic. Finding Products that have an ethical message and a history of fair production in the countries where they are produced is hard. When I came across CACOCO Hot Chocolate line I was smitten with the range of products and the fact that their small but beautiful brand features Products from organic small holder farms in Ecuador. The most interesting thing about their products are the traditional spices and herbs they use for their hot chocolate line, creating unique brands making baking with the chocolate even more exciting. Using the mystique chocolate line from the CACOCO brands, is rich in chocolate and very dark, in combination with fresh Ginger. Using fruits for this recipe makes it easier to believe that Spring might actually come at some point in this year. Currently, the next big snow storm is ahead of us but having blueberry tartes stalked in the fridge makes it easier to believe in the coming spring. As always, I hope you love this recipe and make sure to share. Blueberries and Chocolate, in my mind a perfect combination. The fresh blueberries and the chocolate ganache line the homemade tarte and makes for a light but glamorous dessert for a diner part. You will probably have the ingredients for the recipe at home which makes it even easier. Enjoy this lovely but easy recipe to ring in the beautiful spring months. Leave the vegan butter outside to get soft. Then cut a piece of Ginger of and peel of the skin. Then grind the Ginger or cut in very small pieces. Put the flour on a flat surface and a put a mauled in the middle of the flour and add the butter in small pieces. Then add the ginger, sugar and milk. Mix and knead the dough until you have a homogenous dough. Spread the dough into six tarte forms with 2 ½ inches in Diameter. Then put the Tartes in the oven and bake for 25 Minutes at 175°C or until light brown. Let the empty Tarte shells cool fully before taking them out of shells. Mix 2 Tbsp. of Pudding Powder with 250 ml of Almond milk. Then slowly add the remaining pudding powder, then add the Sugar until the pudding is dense. Take the Pudding off the fire and add the hazelnuts slowly. Now add 1 ½ Tbsp. of the Chocolate Pudding in each Tarte Shell, then add about 12 blueberries on each of the Tarte.